March 23, 1982, may be one of the most important dates in the history of this country�s medical profession. 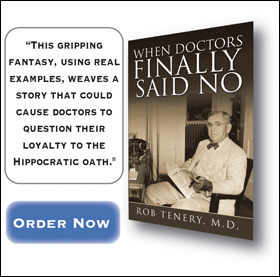 It was on that date, in a split decision, the Supreme Court voted in favor of the Federal Trade Commission�s (FTC) ruling that the American Medical Association and its councils and committees must cease and desist from regulating or impeding advertising by physicians. The decision by the Supreme Court was rendered under the pretense presented by the FTC that restraining advertising impeded competition, which held down costs. For the first time doctors could make known their credentials and areas of expertise to the community. Any individual or organization that tried to stop them could be held liable for triple damages for any income or potential income loss as judged by the court. To the FTC that bases their standards on financial outcomes, it only seemed reasonable that professionals should be allowed to operate by the same practices as the business community. Traditionally, except for emergencies, physicians had acquired patients by referrals from other patients, associates and other practitioners---word-of-mouth. If a particular physician was competent, he or she could expect further referrals. The system was based on abilities. That all changed with the 1982 FTC ruling. Now, referrals could be influenced by promises. The only restriction leveled by the FTC was that claims by those practitioners who resorted to advertising not be false or misleading. At first, physicians were slow to respond, since this was a complete change from the prior principles of conduct for the medical profession. It did not take long until many doctors were buying airtime and news space alongside the car dealerships, beer distributors and carpet-cleaning firms. The reason some physicians chose to participate was because it worked. For the dollars spent, they were able to get back a significant return on their investment---that was if monetary gain was used as the measure of success. Claims are that advertising, or marketing as it is called when it pertains to the medical profession, not only promotes competition, it also provides a benefit to the public through education and earlier therapy. Although marketing does have the altruistic connotation of informing the public, often it is also meant to influence patient choice. As an example, a public service announcement sponsored by the American Heart Association (AHA) and one paid for by a local hospital or physician would seem to have the same intent of public good. If the sponsor�s intent is to inform and not influence referral patterns, the public good is served. If referral patterns are directed so as to benefit the sponsors, then the motivation of the apparent act of beneficence is questionable.� The AHA receives no direct benefit, except potential future donations, while the individual hospital or physician in the above example usually hope to garner more patients. Otherwise, they would have donated those same funds to the AHA and brought their message to an even larger patient population. Even if the underlying reason in this example is one of self-benefit, is there any justification if there is a demonstrable benefit to those who are on the receiving end of these services? The answer is both yes and no. Yes, if there are adequate resources and funding available. No, if these resources are diverted away from more essential needs. Most physicians entering practice have spent years in training. They have watched their peers enjoy luxuries they have been denied, while accumulating significant debt. They often feel they are owed for their sacrifices. They look at the conventional methods of building their practices---long hours, extra-call and getting to know their potential referral base. They are impatient and want more. Sooner. Marketing can potentially help them reach that goal. Seeing that many of their older peers have adopted these techniques with apparent success, why not them? Marketing costs money, lots of money. The funds that physicians spend on marketing come from revenue they generate from taking care of patients. To compensate for these additional expenses, more revenue must be generated---a catch 22 with an increasing amount of limited health care dollars being devoted to acquiring additional patients. Even more alarming is the potential pressure to extract more revenue by performing additional testing or doing more procedures. With the continuing cuts in reimbursement by the government agencies and the third party payers, anything that diverts funds away from necessary patient care or influences practice patterns could potentially decrease quality of care and available resources. To be effective, marketing techniques must influence patients to seek the medical care being proposed. Abiding by the restrictions that the information must not be false or misleading leaves a great deal of room for interpretation. Uncertainty and unpredictability of outcomes are often minimized, while the qualifications of the promoters are emphasized. These have been called �errors of omission.� Tell the truth, just not the whole truth. If potential patients are not fully informed, or the information slanted, they often have unrealistic expectations. If the promised outcome is achieved, there are no problems. If it is not, patients begin to raise questions that can carry over to the whole of the medical profession. Another marketing technique that has found its way into health care delivery is the use of in-kind services. Limousine rides to and from the health care facility, flowers or even a picture with the doctor are not uncommon examples. Although appreciative, patients are often na�ve to the likely intentions of these gestures. �More appropriate to the standards of the medical profession would be contacting patients after discharge to check on them or take a little extra time to sit down with them during a visit to see how they are really doing. The former examples take a check; the latter, the physician�s heart. In the business community if a product or service does not live up to expectations, there is an implied warranty that allows the customer to get their money back or return the product for a refund. With failed medical therapy, sometimes this is not the case. Money back guarantees are not always possible. If permanent damage results from therapies that are acquired through solicitation, would it not seem unreasonable for the courts to treat them the same as product liability? The FTC concept that advertising creates competition that holds down costs appears valid. Most often it applies to the single incident and not always to the cumulative costs from an increased number of therapies generated from marketing. Using the total funding for cataract surgeries as an example, once marketing became the norm, the opposite occurred. In response, Medicare made significant cuts in their reimbursement for cataract surgery. This situation is reminiscent of Aesop�s Fable, The Goose That Laid the Golden Egg. The story tells of a goose that laid a golden egg every day. Assuming the goose had a great lump of gold stored in its inside, the owners killed the goose only to find it was just like any other goose inside. Patients need more from their doctors than customers need from the sellers. Health care services by physicians are, in the ideal, relational. Any time they become transactional, it cheapens this once noble profession. Marketing lowers the dignity of the medical profession. It changes patients� expectations from efforts to results.� Although it often brings financial success to the physicians who participate, patients often think less of them for it. Lacy Timms tapped on the check-in window, her paperwork complete. �I see you haven�t been here for a while,� I said, glancing through her chart. I signaled for her to follow me to the examining room. �I see that you had surgery recently,� I said. My insincere comment went right over Lacy�s head�.